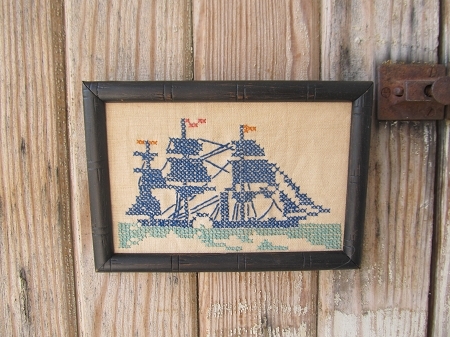 Vintage Antique Nautical Ship Cross Stitch Sampler Frame. My Mom has taken this vintage Cross Stitch of a ship and displayed it in a wooden frame. The frame was painted black and slightly distressed. Size is 6 3/4" x 4 3/4". Wire hanger on back. Great vintage framed stitchery for your home's decor. Only 1 Like it!